Johan Thurfjell is known for his lyrical and suggestive works that, in their reduced form, convey a strong narrative content, evoking sagas and fables, fears and fantasies. Regardless of his choice of material or technique Thurfjell's sculptures, paintings, video works and installations show a dexterity and pleasure in his craftsmanship. For his new exhibition at Galerie Nordenhake Thurfjell forgoes his previous use of mise-en-scène as a story-telling device. 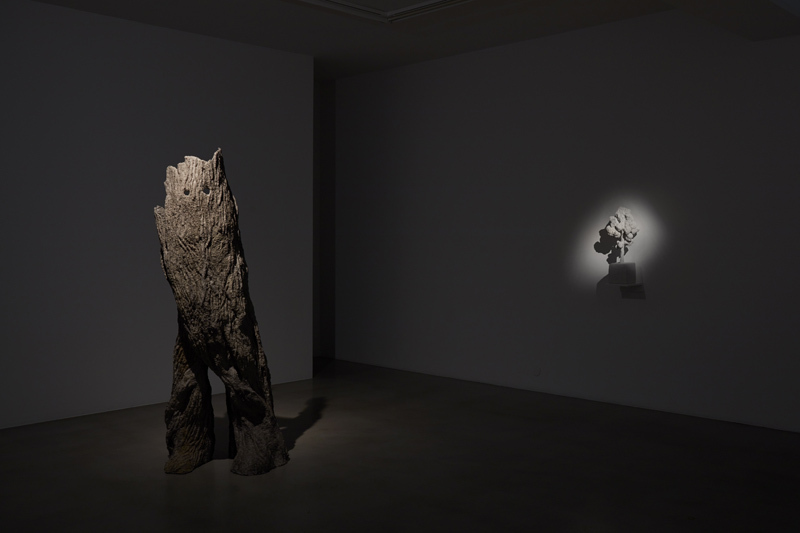 Instead he explores the role of sculpture as a cultural indicator in its earliest and most primitive iterations and examines the communicative potential of form-making as an essentially human endeavour. Working primarily in papier-mâché and clay, in a palette of plain white and painted greyscale, Thurfjell carefully renders the most basic material from an elemental landscape - sticks and stones - to explore the point at which raw material becomes sculpture; when nature becomes culture. The process of transition from nature to culture, indicated in the title of Levi-Strauss's pioneering anthropological classic "The Raw and the Cooked," is illustrated in the working of a branch to fuel, fuel to fire and fire to hearth, creating a symbol for not only warmth and food preparation but also community and by extension, society. 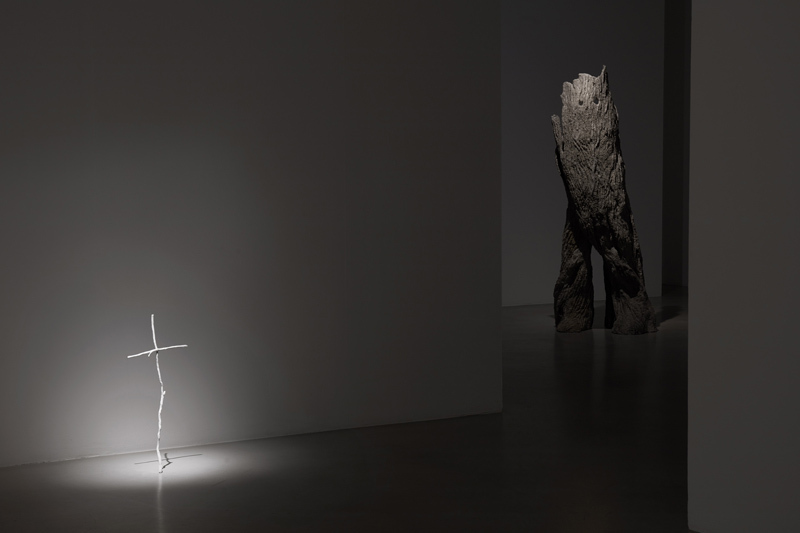 Rendered here in marble-white, the campfire is accompanied by other signs of life: through a small intervention two sticks from the forest floor are arranged into an arrow to indicate direction; in Giant a group of rocks placed in a precarious pile become a cairn, while a standing bundle of sticks and branches bound together suggest a figure in Stick Man. 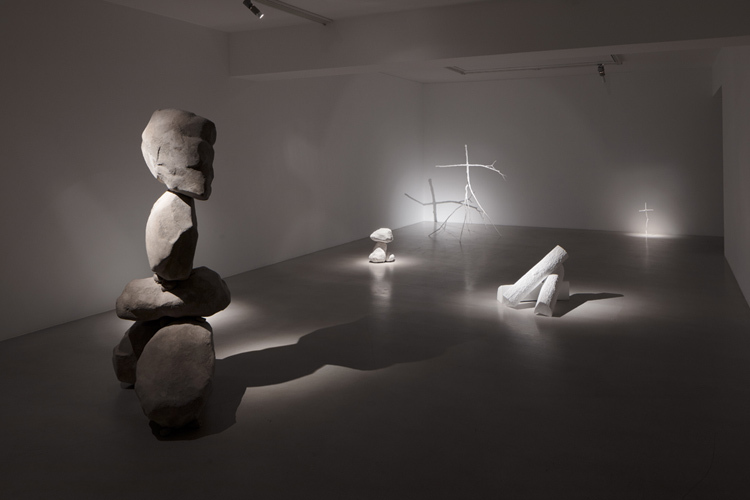 With the simplest of means these first sculptures assume the communicative signs of human existence in an otherwise primordial landscape.